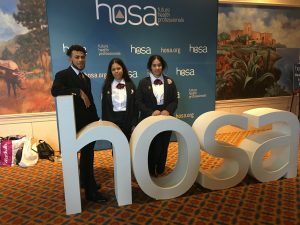 HOSA -future health professionals is a global student organization that provides a unique program of leadership development, technical skills training and recognition exclusively for middle school, secondary, postsecondary and collegiate students interested in careers in health and biomedical sciences. HOSA was founded more than 40 years ago. Highlander was one of the first schools in Rhode Island to join this organization of more than 200,000 members from across the United States and 5 other countries. Highlander high school students competed at the state and international level in 2017 and 2018.